IRELAND WILL FAIL to get a deal to reduce the burden of its bank debt by the end of October, according to the financial news agency Bloomberg. It cited two sources yesterday in saying that details of any potential deal are unlikely to be on the agenda when EU finance ministers meet in Cyprus next week meaning it is unlikely a deal can be reached before the 31 October deadline that was set in June. The government is looking to reduce the burden of the €64 billion in banking debt that it took on when the State bailed out the banks following an agreement in June which allowed for Spain’s banks to be bailed out directly by eurozone bailout fund. It is hoped that this deal can retrospectively be applied to a portion of Ireland’s overall government debt which includes the debts of the banks that it took over during the financial crisis with Taoiseach Enda Kenny describing the June agreement as a “seismic shift” in eurozone policy. While it appeared as if a target had been set to get a deal before the end of October this is now looking unlikely, Bloomberg says, with finance ministers meeting in Cyprus next week to focus primarily on Spain’s cost of borrowing. A Department of Finance spokesperson said that the forthcoming set of meetings between eurozone leaders was important in the process of meeting the October timeline while not specifically commenting on the Bloomberg report. He said: “Work at official and ministerial level is continuing to enhance our programme in line with June 29 summit agreement. 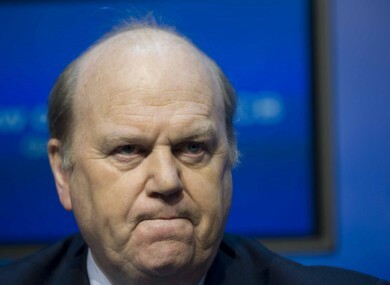 Finance Minister Michael Noonan will meet with a number of eurozone finance ministers next week in a bid to gain support for a deal on Ireland’s banking debt. Meetings with his French, German and Italian counterparts are all planned before Noonan travels to Cyprus where European finance ministers will all meet on Friday. This week the stockbrokers Goodbody outlined a number of possible scenarios for a deal on Ireland’s banking debt including the lengthening of repayment deadlines for the borrowings that were used to shore up the former Anglo Irish Bank which has cost the State some €30 billion. Explainer: What did the EU leaders agree in June? Email “Ireland will 'probably fail' to get bank debt deal by October - Bloomberg ”. Feedback on “Ireland will 'probably fail' to get bank debt deal by October - Bloomberg ”.